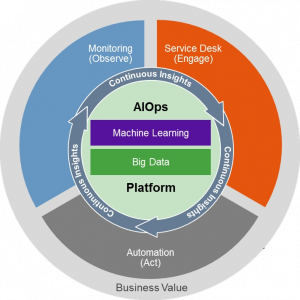 August 2017 ushered in a new term heralded by Gartner in the form of AIOps: Artificial Intelligence for IT Operations. The term has certainly generated a lot of market hype, but what exactly is AIOps, and how can it help support your business operations? IT Operations has rapidly and exponentially evolved over the past few decades to today where the amount of data involved with your application infrastructure is almost incomprehensible. Even more remarkable is that some organizations are still processing and reporting on this data manually using static reports designed decades ago.The need for constant availability and before-real-time insights is what has led us to AIOps. So how does applying Artificial Intelligence to IT Operations address issues presented to today’s IT teams? This ability to derive detailed and accurate information out of the raw data with minimal false positives and false negatives is precisely what adds so much business value to IT teams. Insights into workloads that drive costs: By understanding what is driving costs at what times and understanding hardware capabilities, costs can be optimized and avoided. Eliminating the skills gap: Easier access to data with built-in intelligence allows current experts to spend more time on key decisions and streamlines the learning process for newer members of the team. Provide application availability and eliminate customer frustration: Eliminate application slowdowns on even the busiest and highest transaction days. Avoid costly service disruptions and eliminate firefighting: Intelligence that alerts to key approaching issues allows them to be proactively avoided. Increase business responsiveness: Make data-driven decisions that allow your business to stay up to date with emerging trends. Going forward, businesses will find it harder and harder to remain competitive with their performance by continuing to operate in an outdated and manual fashion. By applying artificial intelligence to IT operations in the performance and capacity discipline, problems are easier to understand, resolve, predict, and prevent. Better intelligence; better availability; better results.